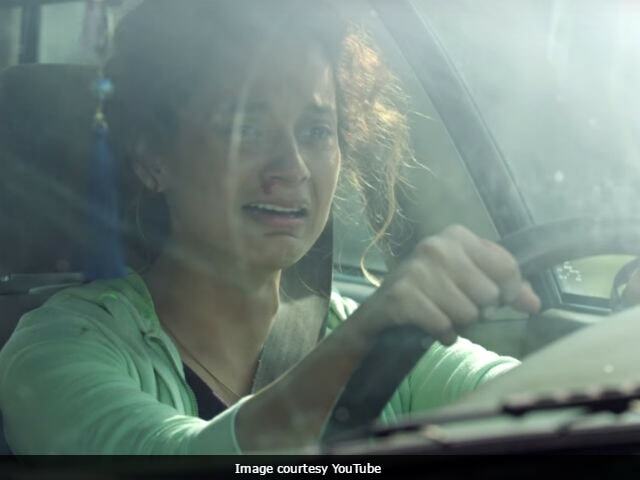 The trailer of Kangana Ranaut's much-talked about movie Simran has finally been unveiled by the makers of the film. In Simran, Kangana Ranaut will be seen portraying the role of Praful Patel, a Gujarati woman who lives in New York and is a divorcee. The two-and-a-half minute trailer takes us through the various phases of Praful's life and shows that she is a shoplifter and addicted to gambling. However, she knows how to live her life to the fullest and confidently tries to woo men with her cheesy one-liners. "Boyfriend hona koi character flaw thodi hai. Ladke patana toh talent hota hai," she tells her prospective man. At the end of the trailer, Praful is seen on a robbery spree with cops chasing her. The guy she is in love with leaves her but yet she's smiling. Simran has been directed by Hansal Mehta and co-produced by Bhushan Kumar, Krishan Kumar and Shailesh R Singh. Simran also features Soham Shah, Esha Tewari Pande, Manu Narayan, Aneesha Joshi and Rupinder Nagra in pivotal roles. The film has been extensively shot in the United States. Simran will release in theatres on September 15. After Simran, Kangana Ranuat will feature in Manikarnika: Rani of Jhansi, which is a biopic on Rani Laxmibai. She will also soon be making her debut as a producer and director with an English language short film The Touch.